Providing sound systems/AV equipment/lighting effects and music for over 50 weddings each year simply means we have the experience. How can Entertainment Solutions assist you? 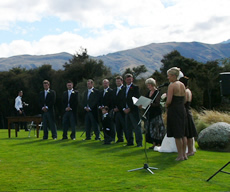 If you are planning an outdoor ceremony don't underestimate the value of a good sound system and an experienced operator. We have been in the sound business for the past 22 years and work closely with our local celebrants to provide a high quality but discrete sound package to cover all the options on your special day. We will supply and set up a suitable sound system with microphone and lecturn for your speeches. We will also provide a CD player or ipod/laptop connection for playing background dinner music. We can provide a sound operator or you can use a DIY option. 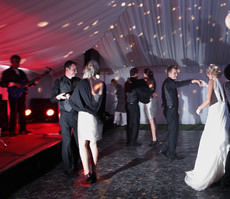 We have a DJ option or can put you in contact with a band or musicians. If you would prefer to DIY we can provide a sound system to connect your ipod or laptop. 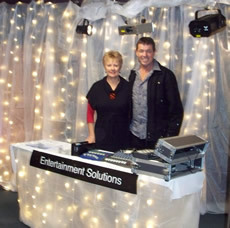 We have been operating a sound and lighting equipment hire business in Wanaka for the past 22 years. We have an extensive range of sound systems for DJ's and bands, equipment including drums kits, bass rig, guitar amplifier, keyboard & electric piano & microphones. Ideal if your band or DJ is having to fly to perform at your wedding dance. Our lighting hire department includes a full range of fairylights including fairylight curtain effects for indoor and outdoor application, LED par cans offering endless colour choice. Coloured spot lighting with dimmers. 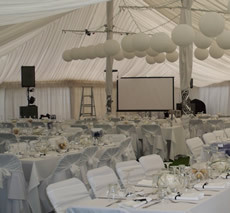 Mirrorballs, ropelights, dance floor effect lighting, UV , bubbles , smoke , we can even make it snow on your wedding day. We offer a delivery and installation service. We can provide up to 5 carpeted staging units of 2450x1850x350mm(H) each. These are ideal for your band or DJ. It is worth considering the possibility of a projector and screen for a slide show presentation either from a laptop or DVD. We have a variety of screen size options up to 4.3 metres wide. If you have a small guest list then our 40” LCD TV is a very compact option. We have a Honda 2KVA ultra quiet generator especially suitable for ceremonies that are out of reach of a power connection . We understand that on your special day there may be something out of the ordinary or unique that you may wish to happen. We specialize in special requests. If we can’t help you then we will put you in contact with the person that can.